Warning: Contains a hot male/male romance, copious instances of taking the Lord's name in vain, and love against the kitchen counter. Author’s Note: This book was previously released under the title In Front of God & Everyone. It took me a week to read Goodbye Paradise. Now anyone who knows how I read will think it’s because I couldn’t get into the book because I usually read a book a day, sometimes more. However, I chose to savor Josh and Caleb’s story, reading several chapters a day instead of devouring it in one sitting as I easily could have done. I wanted to spend time with them on their journey – experience their sudden departure from Paradise, watch them avoid danger and find the goodness in humanity as they made their way across the country to Massachusetts, see them make friends and family as they found out who they were and who they wanted to be, and fall in love as they discovered that two men could share their lives and love with one another. I absolutely loved Goodbye Paradise and am glad that I was able to force myself to read it over several days because it meant that I got to spend even more time with Josh and Caleb. For some reason, I enjoy m/m romances that contain a religious theme, whether it be the characters overcoming religious zealotry to find happiness or showing how they balance their religious beliefs and homosexuality despite the prejudices of homophobic Christians who use the Bible to condemn them. As such, Goodbye Paradise is the kind of m/m romance I would have snagged on its own merits. But as a fan of Bowen’s True North series, I was familiar with Paradise because of Zachariah’s story and wanted to know more about the world he had escaped. Although Josh and Caleb exit Paradise by the end of the second chapter, it was more than enough time to get a pretty good picture of just how dark their lives were there, especially Josh’s as he struggled both internally with his “impure thoughts” and externally as the target of bullying by the older bachelors. Paradise is one of the worst kinds of perversion of religion you can imagine and don’t want to believe exists, but they do. So as difficult as it was to see Josh thrown out like trash, I couldn’t help but be relieved for him; of course, knowing that Caleb planned to join him so they could “escape” together made it easier for me to have hope for them. Goodbye Paradise is an interesting mix of coming of age and new adult genres. Because Josh and Caleb were given responsibilities and put to work as teens, they are more mature than the characters we often see in these genres. Due to his job, Caleb has more knowledge of the world outside of Paradise and is able to help guide Josh somewhat. It is Caleb’s limited experience that helps them find a safe ride to Maggie’s farm in Massachusetts. Once there, we get to watch both young men come into their own as they discover that life is not at all the hellfire and damnation they’ve been raised to fear. I especially loved watching Josh flourish as his innate caretaker was able to show his love and provide for those around him in ways that would never have been allowed in Paradise. But never fear, Bowen does provide a perfectly angsty plot twist that tips its hat at the new adult genre perfectly, at the same time it will likely make you want to shake Caleb… vigorously. Despite his more “worldly” experience, Caleb never dreamed that their departure from Paradise would enable him to live with Josh as anything more than roommates, so to see that unexpressed wish come to fruition was beautiful, just as beautiful as the final chapter in the book. I cannot adequately express how happy I am that the author chose to rerelease this book under her Bowen pen name, making it easy for fans like myself to discover Goodbye Paradise because I loved it. I cannot wait for the release of its sequel, Hello Forever. 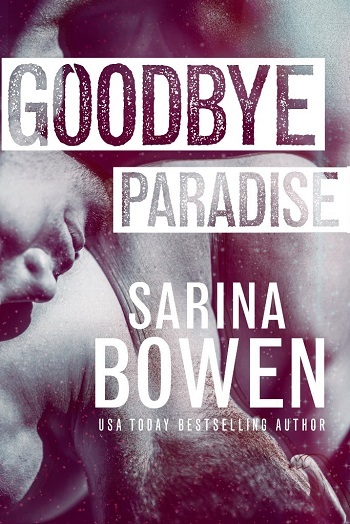 Reviewers on the Wicked Reads Review Team were provided a free copy of Goodbye Paradise (Hello Goodbye #1) by Sarina Bowen to read and review.